DC Comics wants you to enter daily for a chance to win the coolest Scooby Doo Apocalypse themed prize package with the movie, autographed by famous comic book artist Jim Lee and great Scooby-Doo themed collectible toys worth more than $300! 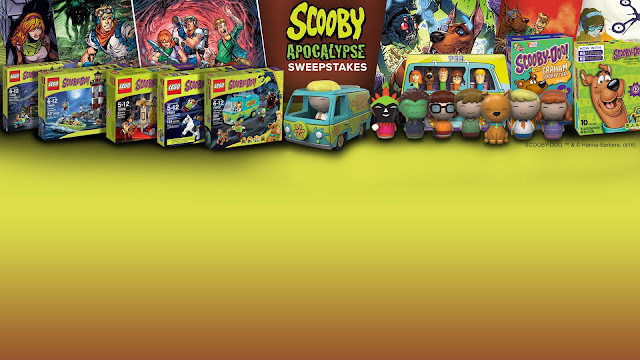 Grand Prize One (1) Grand Prize Winner will receive the following: - One (1) DC Scooby Apocalypse #1 (Signed by Jim Lee) – ARV $3.99 - One (1) DC Scooby Apocalypse #1 Variant 1 – ARV $3.99 - One (1) DC Scooby Apocalypse #1 Variant 2 – ARV $3.99 - One (1) DC Scooby Apocalypse #1 Variant 3 – ARV $3.99 - One (1) DC Scooby Apocalypse #1 Variant 4 – ARV $3.99 - One (1) DC Scooby Apocalypse #1 Variant 5 – ARV $3.99 - One (1) Box of General Mills Scooby Fruit Snacks – ARV $3.00 - One (1) Box of Betty Crocker Scooby-Doo Fruit Flavored Snacks, Keebler® Scooby-Doo Graham Cracker Sticks – ARV $5.00 - One (1) PEZ Scooby-Doo Gift Set – ARV $11.00 - One (1) LEGO Scooby-Doo Mystery Mansion Gift Set – ARV $39.00 - One (1) LEGO Scooby-Doo Haunted Lighthouse Gift Set – ARV $39.00 - One (1) LEGO Scooby-Doo The Mystery Machine Gift Set – ARV $39.00 - One (1) LEGO Scooby-Doo Mystery Plane Adventures Gift Set – ARV $39.00 - One (1) LEGO Scooby-Doo Mummy Museum Mystery Gift Set – ARV $39.00 - One (1) FUNKO Dorbz: Scooby-Doo Vinyl Pop Figure – ARV $11.25 - One (1) FUNKO Dorbz: Scooby-Doo Mystery Machine Vinyl Pop Figure – ARV $11.25 - One (1) FUNKO Dorbz: Scooby-Doo Daphne Vinyl Pop Figure – ARV $11.25 - One (1) FUNKO Dorbz: Scooby-Doo Fred Vinyl Pop Figure – ARV $11.25 - One (1) FUNKO Dorbz: Scooby-Doo Shaggy Vinyl Pop Figure – ARV $11.25 - One (1) FUNKO Dorbz: Scooby-Doo Velma Vinyl Pop Figure – ARV $11.25 - One (1) FUNKO Dorbz: Scooby-Doo Werewolf Ghost Vinyl Pop Figure – ARV $11.25 - One (1) FUNKO Dorbz: Scooby-Doo Witch Doctor Vinyl Pop Figure – ARV $11.25 Approximate Retail Value (“ARV”) of the Grand Prize: $330.94. This Sweepstakes ends on 05/25/16 and you can ENTER DAILY to win.